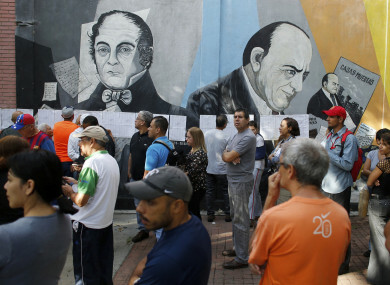 People line-up to enter to a poll station during the election for a constitutional assembly in Caracas, Venezuela. A CANDIDATE FOR Venezuela’s controversial Constituent Assembly is among five people killed in anti-government clashes between police and rioters. Deadly violence has erupted around a controversial vote held today, with troops firing weapons to clear protesters in Caracas and elsewhere. The 39-year-old lawyer Jose Felix Pineda, who was a leading candidate in the elections, was killed from multiple shots fired by assailants who broke into his home overnight, prosecutors said. He was the second candidate to be murdered, after Jose Luis Rivas was killed on 10 July as he was campaigning in the northern city of Maracay. Youth opposition leader Ricardo Campos (30) was also killed in protests against a vote to form a group that would change the Venezuelan constitution. President Maduro’s determination to hold a vote today to elect a new body has triggered deadly protests and international criticism. Yesterday, Venezuela banned protests that could disturb the election vote, and the US advised family members living in their Caracas embassy to leave the country. Maduro has continued resisting opposition efforts to hold a vote on removing him, vowing to continue the “socialist revolution” launched by his late predecessor Hugo Chavez. The clashes over the past four months have resulted in more than 100 deaths and left thousands injured and detained. The Constituent Assembly will comprise 545 elected representatives, 364 of whom will come from municipal circumscriptions (one from each, except state capitals which will get two, and Caracas, which will get seven). That could favour rural areas, where Maduro has greater support. The other 181 members will be drawn from unions – another source of Maduro support – civil and social groups, business groups, and indigenous communities. The assembly is to be tasked with amending the constitution passed under Hugo Chavez. But it will also have the power to change laws and dissolve the legislature, the National Assembly, which is controlled by the opposition. Maduro has promised the new constitution would be put to Venezuelans for their approval in a referendum. Why does Maduro want it? Maduro says the assembly will give power to the people to help Venezuela survive what he says is a US-backed right-wing coup plot to topple his socialist government. “We need a power that is above the other powers that are sabotaging the country’s development,” Maduro said. But he has not explained what should be changed from the current constitution, nor what specific reforms would put an end to Venezuela’s political and economic crisis. His opponents suspect the move is aimed at strengthening his hold on power by filling the assembly with his supporters. Among the candidates wanting to sit on the new assembly is Maduro’s wife, Cilia Flores. Allies of the socialist president say the assembly will target opposition leaders, stirring warnings that Maduro will use the assembly to install an autocratic regime. Most Venezuelans don’t want a Constituent Assembly. According to Datanalisis, a polling firm, 70% are against the idea. On 16 July, a third of those eligible to vote (7.5 million) came out in an opposition-held unofficial referendum to vote against the election of the body. The opposition coalition, the Democratic Unity Roundtable, has called a boycott of the ballot. But that means Maduro’s supporters will be the only ones voting – and possibly more than once, according to an analysis by an expert, Eugenio Martinez. Critics say the process around the assembly and a new constitution would delay overdue regional and local polls, and perhaps even the presidential election set for late 2018 – which the widely unpopular Maduro would be sure to lose. The United States and other international powers have urged Maduro to drop his plan and respect the electoral calendar. Email “Candidate shot dead as Venezuelans line up to vote in controversial election”. Feedback on “Candidate shot dead as Venezuelans line up to vote in controversial election”.